This Matthew Boulton candlestick arms arrived with one arm hanging on by a thread of metal and another arm actively breaking. This page shows step-by-step how it was repaired and the issues involved in the repair. Sheffield Plate is a sandwich of sterling silver, copper, and sterling silver. The silver is like a thin slice of bread on either side of a sandwich, and the copper is the "meat" on the inside of the sandwich. This innovation was an effort to make more affordable silver objects. Most astounding to metalsmiths and silversmiths, the assembly of the genuine Sheffield Plate used lead. Lead was also used to fill the core of the candlestick body, arms and candlestick. Thin pieces of silver wire were applied to the seams and edges to conceal the lead or copper core. Needless to say, the candelabra arms and main stem were very heavy. The photo above shows the Matthew Boulton candlestick arm broken leaving a gaping hole in the base. My first decision was to created a tapered brass wire to fit inside the care of the arm. Brass can be very hard so it is ideal for a core support. The brass wire gets very hard quickly. In the tapering process it needs to be annealed to cheery red and air cooled to anneal. I needed to bend the very hard brass rod in a curve to match the arm. Steel tools and hammers work well for this purpose. Comparing the curve of the tapered brass rod to the Matthew Boulton arm. The tapered brass rod had to match the curve of the arm so that it could be inserted into the arm for internal support and strengthen the repair. The brass rod had to fit inside the silver arm and candelabra arm base. 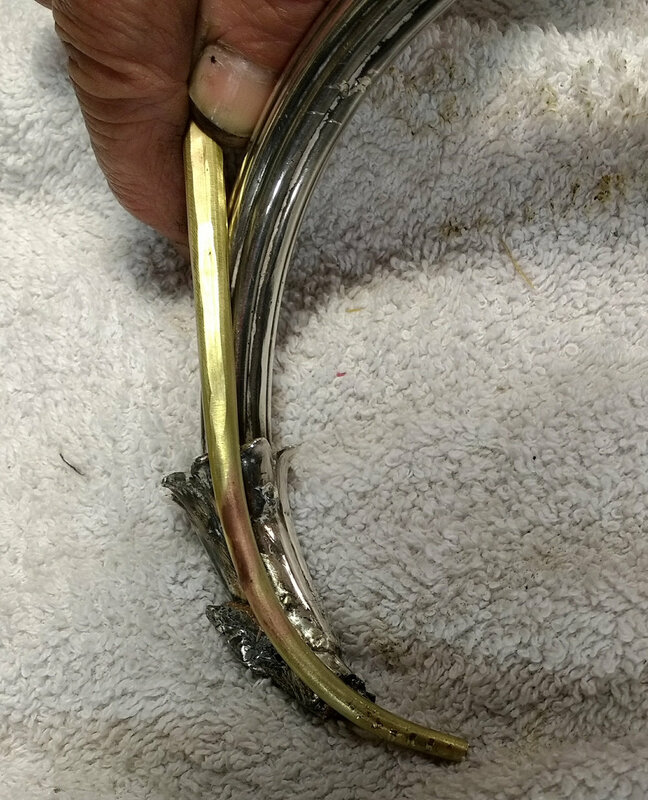 A core of a solid brass rod would add significantly to the strength of the repair. The brass rod also helped hold the arm in place while it was being soldered so the arm would be perfectly aligned. This was very challenging in itself. After the arms were attached there were other problems to repair. The Matthew Boulton candlestick arms has a sheet of Sheffield plate on top of the arm base, but the weight of the arms was lifting up this top plate as the arm sagged down. I used chasing tools to push down the top plate, but the arms definitely need more support and a way to conceal the rip (shown in the top photo.) For this purpose of created two tapered sterling wires to reinforce the broken arm and cover the rip. The larger wire fit the outside. The smaller wire fit on the inside of the arm. The pink arrow point to the tapered sterling silver wire on the outside reinforcing the repair and concealing where it was ripped. One for each of the two arms. Repairing this Matthew Boulton candlestick was a real challenge both technically and aesthetically. In my opinion, it was important for the repair to be attractive, yet unobtrusive, and authentic to the original design. As previously mentioned, the original old Sheffield Plate was soldered together with lead. Lead is not that strong. It is soft and stretchy. This candlestick seam was opening from the weight of the arms leaning down, and pulling up the sheet. To reinforce the top layer, I added a very fine silver wire all the way around. The blue wires are pointing to a sterling wire that concealed the lead seam that was opening up, and added structural reinforcement. Low temperature solder was used to solder this wire in place. The blue arrow points to the fine silver wire added to the edge of the base. The pink and yellow arrows point to the tapered sterling silver wires that support and reinforce the repair of the arms. 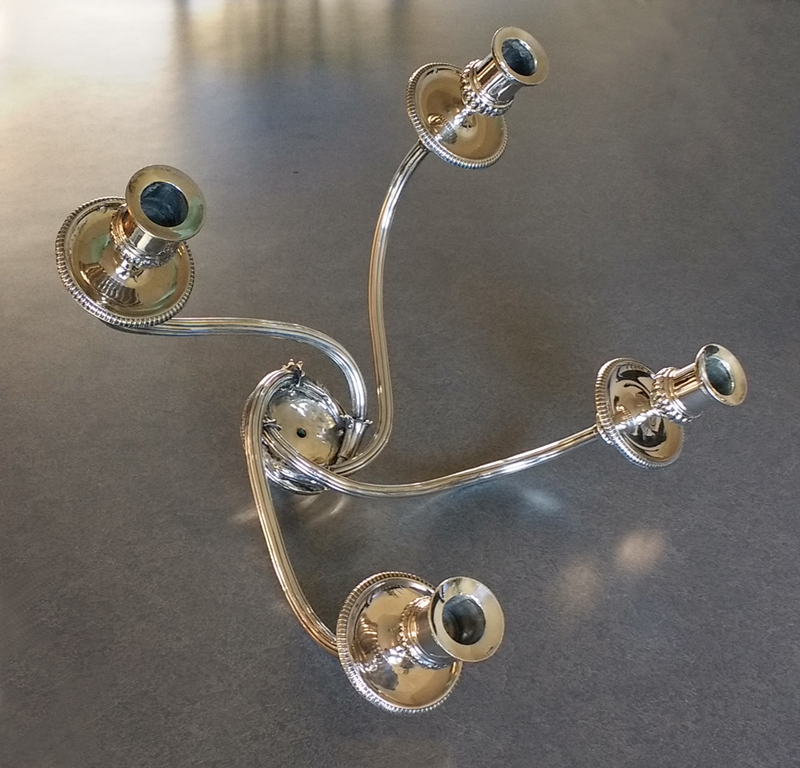 Matthew Boulton candelabra arms repaired and polished. Using sterling silver wire was helpful in creating a refined appearance. I could polish the sterling after it was polished, and it concealed the copper core and lead seams. It is almost invisible integrating well with the design.